Way to get rid of Actionclassicgames.com? [Main4videocontentingfine.icu] fake Adobe Flash Player update alert removal. [Fixfinishgreatfileclicks.top] fake Adobe Flash Player update alert removal. Tzxykgpzw3464.site fake Java Update pop-up removal. Jzuxefkqn2869.site fake Java Update pop-up elimination. What is Xs.exe – Virus, Trojan, Malware, Error, Infection? One Click Booster phony optimization tool (elimination guide). PCMate Free Privacy Cleaner phony optimization tool (removal guide). How to remove Trojan.Tefosteal virus? This guide explains the danger associated with the file called speed-checker.exe. The odds are that this file is the executable (installer) of System Care Antivirus fake anti-spyware program. If you ever see this file on your system, please do not ever click (execute it). There’s a danger associated with this file, because it may bring the rogue anti-spyware onto your PC. Certain specific features of System Care Antivirus program clearly prove its malicious origin. In particular, we mean several of its outward peculiarities, i.e. its GUI and some other inner parameters. The tool claims to be able to scan your computer for availability of possible threats, such as malwares, viruses, spyware, rogues – the items that could represent danger to your system security if they indeed enter your system. 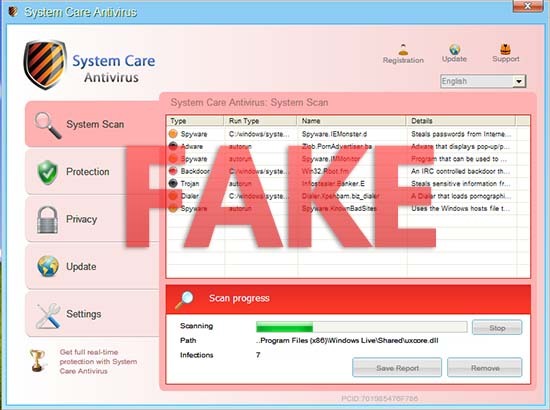 At the same time, in this specific situation all threats reported by System Care Antivirus are fake (invented infections). In order for us to be more precise, the application intentionally notifies users of fake cyber infections simply in order to give you quite a considerable volume of scary but yet fake information. The recommendations that are given after some of those bogus system scans and deceitful popup alerts are quite predictable – the scam instructs you to click the registration button on its interface window and fill in your private and bank details, including credit card information – to finish the registered copy authentication. Thus, the hoax is nothing but the next clearly earnings-directed instrument prepared by crooks to gain more and more funds. Even if one purchases System Care Antivirus such purchase will not assist in times of real virus attacks on PC security. There will be some imitation of threat elimination, but the truth of the matter is that that these reported threats never were present on your computer. READ Freedownloadcontentmachine.icu fake Adobe Flash Player update alert removal. Thus, it makes no point performing this rogue’s admonitions or trusting it. It’s strongly recommended that you take some time to research the issue of its successful removal. You may find out how this fake anti-malware can be deleted. In case certain extra issues take place along the way, please make sure to share your comments and we’ll do all our best to assist you.